On behalf of Sr Marie Hesed, Sr. Mary Bethany and myself, and all the Sisters of Our Lady, I would first of all like to thank the Most Holy Trinity and Our Lady for the privilege of accompanying Sr. Maria Lucina in these last months of her life. None of us, including Sr Lucina, knew that when she came to us in September. But coming here to Iowa was a part of God’s plan for her at the end of her life. Every person’s life tells a story and Sister’s life was no exception. Sister’s life was part drama, part mystery, part unfolding plan or dream of God in her life…but all gift of God’s love. She knew that her life was part of the greater story of Jesus’s life, which revolved entirely around the love of the Father, and the drama of salvation and restoring us in our relationship with the Father so that we could be one family of our Father. Shortly before she died Sr. Lucina one night said that all she’s ever really wanted is to be loved and to love. You may think that sounds like a needy thing to say. However, if you are in touch with the deepest desires of your heart, as she was, that’s what you come to discover: Pope St. JPII says we cannot even know ourselves unless love is revealed to us from the outside. We need to experience love or we remain a mystery to ourselves. And once we do, then we’re able to go outside ourselves and love others in the same way. Sister certainly knew great love from her family…she had such deep love for her Mom, Dad her sister and brothers. I’ll never forget how she lit up when her brothers arrived at two in the morning… The night she was waiting for her brothers to arrive, Sister suddenly sat up and reached out in awe. I asked her what she was seeing. She said: “angels! They are so beautiful!” I said we wished we could see them too but to ask those angels to get her family here first. And they did. And then I reminded Sister that soon she would see pure beauty face-to-face. Sister had this experience of love in a very special with Lindsay. Nothing more powerful than the mother-child bond. Extremely moving. She had this love from Fr. Pinto and the DJMs. She had it in her SOLT communities and especially with the Sisters she went through formation with… And she had it in a special way here in Iowa. Iowa was very healing to her. She said several times as she was getting closer: “I’ve never been in a community like this before. They so quickly take you to themselves and just love you.” And when she said she wanted to be buried where she would be remembered and prayed for, we knew Willey was the place for that. Sister was very happy at the thought of being here. Something Pope Francis says reminds me very much of Sister: “Jesus became man so that man, made inwardly deaf and dumb by sin, would become able to hear the voice of God, the voice of love speaking to his heart, and so he would learn to speak in the language of love, to communicate with God and with others”. That was a life work of Sister’s. Looking for and living out of God’s love and being able to communicate that to others. It wasn’t always easy for her to do this. Most of us can say the same. But she knew ultimately our lives are about love. In the evening of life we will be judged on love, says St. John of the Cross. Initially the treatments seemed to really work. Her numbers plummeted by 600 points and she felt we were headed in the right direction. But then complications set in to such a degree that Sister wasn’t able to get any traction and her numbers remained the same while some of her symptoms got much worse. Because I knew Sister at a spiritual level I suspected something else might be happening and so I asked her if she had ever made an offering of herself for someone specifically. In religious life we all make an offering of our lives when we profess vows. We give ourselves to Christ and His Church in a complete self-offering of love. And Jesus then has complete freedom to do with us what He wants, which is always good and always from love. 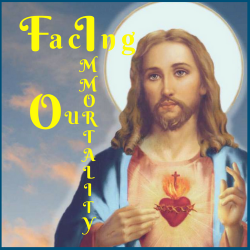 Sr. Lucina said that she had re-offered her life very specifically in sacrifice to God because she had had a full life. When making this new offering with specific people in mind especially that she loved, she didn’t know how God would use it. Would He simply ask her fight the battle of disease and then He would heal her or would He want her to lay down her life completely as Jesus did for us, knowing her suffering and death in union with Him would produce eternal fruits especially in the lives of those she loved. In the meantime, she fought, all the while believing in what she was doing. But once she realized that God was not going to heal her, she surrendered to that in order to comply with His will. Sister was aware that there had always been only 3 possible outcomes: God would heal her through conventional and/or alternative means. He would heal her miraculously. Or He would take her home to Himself. In all three instances she would win. And she knew ultimately that the third instance was the best. Because no matter what healing we get here, it’s always temporary. Lazarus had to die again as did the little girl and the widow’s son whom Jesus raised from the dead so that they could be fitted for the final healing at the end of the world with a resurrected body like Christ’s body in Resurrection. We both used to make jokes about holding out for the glorified body, especially when going through illness and the effects of aging. In the end, Sister came to the fullness of a kind of love which made her like Jesus, when she made the offering of her life for one she loved. Her last week went fast. It almost seemed unreal. She went into the hospital on Monday, with the news that her treatment was no longer working and the cancer was gaining ground quickly. By Saturday, after waiting for her daughter, and the rest of her family to arrive, she was ready to go home. As we chanted morning prayer from the common of the Blessed Virgin Mary, she went home with Our Lady during the chanting of her favorite psalm: 117 which is also her birthdate and which God used many times in her life when making important discernments. Many things in Sister’s life are a mystery, and were to Sister herself. But in the light of eternity everything will be revealed. The drama of Faith, that was played out in Sister’s life will be recorded in the Book of Life and with those of all other faithful souls, will be read in heaven over and over again to the delight of its citizens. Everyone has an important part to play in the grand story that ends in the triumphant victories of Christ and the communion of God with man for all eternity. Sister has played her role out in time. We count on her continuing now to help us from heaven. We love her and we’re going to miss her but she is home now in the arms of the greatest love and the real love she sought throughout her life. We thank God for the gift of her life and for her witness to the kind of self-sacrificing love that made her like Jesus in the end.